Giving away my twenty World Book Night copies of The Knife of Never Letting Go didn’t prove hard at all: Tuesday was a gorgeous spring day, and in the late afternoon and early evening I walked through my city’s packed streets and parks and found eager, grateful recipients for ten books. The remaining ten copies were left in places where I knew they’d be found, and I have had word that by the next morning they were all gone. I decided from the beginning that when approaching people I wasn’t going to be pushy: I was going to accept “no, thank you” for the valid answer that it is and move on. There were some people who were hesitant, and in those cases what I did was tell them a little bit more about this book that I love so very much – after which some said yes, and others said no. I loved the experience of being a World Book Night giver, but halfway though the day I had an epiphany of sorts: I stopped feeling like the fact that it was the readers who were taking the books off my hands meant I was doing it wrong. I don’t want to make hasty assumptions about the people who took my books, but my suspicion is that they all shared a baseline level of receptiveness to the idea of reading a book, and that you need to have that to work with for something like this to be a success. 1) I love World Book Night. I love the passion and generosity behind it; I love that there’s a day when all this enthusiasm about reading finds a public expression and gets so much media attention. Seeing excitement about books always makes me happy, and I do think that collective excitement has a way of being contagious – people want to find out what the fuss is all about, and in the process they often discover that they’re interested in things they never paid much attention to before. 2) Spreading a love of reading is something that matters to me, both as a person and as a libraries professional. There are several reasons for this: the most obvious one is the fact that literacy is a crucial skill in our world, and the more you read, the less likely it is that you’ll become one of the millions of people who are functionally illiterate. Being a confident reader has the potential to improve people’s lives in tangible ways. Then there’s the fact that I think stories matter and play a crucial role in our lives, for all the reasons so brilliantly articulated in this post. And while books are not the only way to engage with stories meaningfully (a point I’ll return to later), they remain an important way. So yeah: I want more people to discover the pleasure of reading; I want to live in a world where there’s a vibrant and thriving literary culture – and while I’m more optimistic than most when it comes to how endangered the habit of reading for pleasure really is, the idea of introducing new people to books is one I can absolutely get behind. Through its unique delivery World Book Night involves tens of thousands of people in sharing the value of reading in their communities and delivers brilliant books directly into the hands of those who might never otherwise engage with books and reading. I do think there are brilliant and creative ways of achieving this goal, and I have no doubt that there are plenty of people out there who managed to do so. Also, I realise that by writing this post I run the risk of coming across as having given up from the get-go. It’s very easy to wonder whether if I had tried harder, some of the noes I got would have been yeses. What I started thinking about halfway through World Book Night, though, was what would happen if we collectively decided that this was enough. 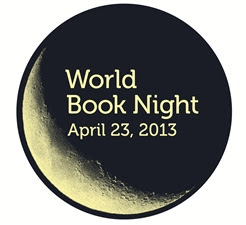 World Book Night is a wonderful initiative that runs purely on a passion for books, and what could be better than that? But the reasons that make people decide that reading is not for them are complex and demand complex solutions. Obviously World Book Night never claimed to be the ultimate fix-all response to the literacy divide, and it’s important to get behind solutions that help in small ways, because all those efforts do add up. But I really hope that amidst all our enthusiasm, we don’t get caught up in thinking that we have done our bit and that all that’s left now is to shrug and feel sorry for the people who wouldn’t accept the gift of a free book. Throughout the day I saw many, many tweets along these lines: people repeatedly said they felt sorry for, pitied, or wanted to cry for all the people who had refused the books they were trying to give away (ETA: though this was not the only thing I saw, of course). I understand where they’re coming from: it’s saddening to be rejected when you’re trying to share something you’re so passionate about and that you think others should embrace. But I worry that no matter how good our intentions, when we say we feel sad for others we come across as just one more voice tut-tutting people for not doing more of what they “should” be doing, when they’re already under so much pressure. I’ve written about my concerns that the way we try to sell reading is potentially condescending and counter-productive several times over the years, and World Book Night caused all those thoughts to resurface. My takeaway from being a World Book Night giver is this: the only way I can make the event meaningful and rewarding for me personally is if I think of it as an opportunity to pass on a specific book I love to others, with no questions asked and no assumptions made about their reading habits. I can’t feel that to succeed I have to take on the many complex problems surrounding the perception of reading as an elite activity. I can’t make it about how we should be challenging these problems but sometimes end up accidentally reinforcing them. The other reason why I made a deliberate effort to stop wondering whether the people getting my books were reluctant readers is because I think we should remember more often that people who are already readers also benefit immensely from readers’ development initiatives. I worry that the idea that if you’re a reader then the job has been done reinforces the myth that “reader” and “non-reader” are static, discrete categories. I worry that it reinforces the idea that being a reader means belonging to an exclusive club where you’re either all in or all out, and that people walk away in shame because they don’t think they’ll ever be allowed to be all in. I want people to read more, but I also want to remember that in many cases it will take more than an eager stranger with a box of free books to convince them to take the plunge. I want to spread a love of reading, but I want to find a way to do so without perpetuating the myth that readers are superior human beings by definition; that reading books is the only way to be an intelligent, thoughtful person who’s intellectually engaged with the world. There are other meaningful ways to consume stories or information, and I don’t want to tell the people who favour them that I pity them. I didn't have anyone turn me down this year but I wouldn't have pushed on people either. If you get too pushy and they take the book just to get you to leave them alone, have you really accomplished anything. I was thrilled when I walked yesterday and saw someone reading the book I'd given her on Tuesday. It always strikes me when two people come away with such different experiences. I never saw any tweet regarding "pitying" or "feeling sorry for" people who didn't accept books. Instead, I saw a great love for putting books into the hands of people. Period. My mom and I didn't ask if people were readers or not. The way I look at it, even people who enjoy reading don't necessarily read often. I hear people say, "I love to read, but I just don't have the time." If Tuesday encouraged them to go home and delve in, then I'm happy. If that book sits on a shelf or is passed on to someone else, I'm still happy. For me, WBN isn't about force feeding reading. It's about what you said - sharing my love of a specific book and connecting with someone. The firefighters we handed out to didn't seem to care much about the books, but they were sure glad to have the opportunity to show off the fire engine and their fire house. And any community event like this has that component. We also stopped at the grocery store, people running in and out, busy and tired. We got more smiles than anything else, and a lady watching from her car cheered us on. Maybe it was no longer about reading and more about community at that point. But I'm ok with that. Kathy: That's a lovely thing to see. I doubt I'll see any of the people I gave books to again, but it makes me happy to think of the books read and loved. Jenn: The expressions of pity were not the only thing I saw - but the fact that this is what I focused on in this post probably says something about what kind of person I am, and this is something I should go away and think about. I wanted this post to have conveyed my deep love of and appreciation for WBN and everything it stands for - for people like you and your mom and all the givers I saw online and offline, as well as my concerns about how the way we as a culture sell reading may sometimes backfire. Community is every bit as worthy a goal as reading, and I wanted to acknowledge that. But I wrote clumsily and that's not how I came across. So I'll just say that I love what you did, that I loved being a giver, and that I'd jump at the chance to do this again in the future. I didn't intend for my comment to be a criticism but an alternative. There will always be those whose motives are...different and who hold attitudes dissimilar from my own. I don't necessarily think these are easily changed, and too often, they come out in the book world. I see it at my uni, even though I fight against it in my own classroom. I don't want to be that kind of reader, that kind of person. But I also know that I cannot change the professors who treat students harshly, who make comments as to their intelligence. All I can do is make my classroom a haven from that (whether or not the students want it or even notice). Is my ultimate goal that they'll love to read? No. It would be nice, but it isn't essential. My ultimate goal is that I help them in their progress as thinkers. You know, the idea of creating a haven is something I've been focusing on more and more: I can't change the whole world, but instead of being discouraged by approaches that I think are maybe not helping, can put forward my own approach. I've been thinking about this a lot when it comes to feminism, when it comes to reading, when it comes to the way the two intersect. Thank you for reminding me that WBN can be yet another opportunity for that. I know there were many, many people who gave away books in a way that makes literature appear accessible and not the reverse (and I did witness that, on blogs and Twitter and elsewhere), and that's worth celebrating any day. Oh Ana, I love this post!!! And I'm with you, I've never quite bought into the gloom and doom predictions for the future of books, and I don't think it's naivety that makes me feel that way. Maybe it's because my life experience is so much different than I hear from so many other bloggers, etc. So many people have mentioned that they started blogging because they wanted a place to talk about books and talk with other people who enjoyed reading because no one in the lives outside the internet were readers. I guess that makes me particularly lucky, because nearly everyone in my life is a reader. Probably 90% of my friends and family are avid readers (not counting my online friends which would obviously skew that percentage far higher). And it's not like I'm from a wealthy, well-educated family. To this day, only about 5% of us have been to college. Decidedly blue-collar heavy, we are--machinists, construction workers, housewives, mechanics, etc. And yet, we are a family of readers. Anyway, I only say all this because I think many people have this stereotype in their heads about readers that just doesn't hold up (you know, the way stereotypes never do). And your last paragraph--that's something I definitely need to be careful about. While I don't hold any notions about "what kind" :/ of people are readers, I do have this tendency to think all people are readers. Obviously that's not the case and obviously that's a really stupid notion to hold. And to be honest, it's made it very hard for me to understand Max. I have to be forever diligent in my thoughts about him and reading. He isn't a reader, all the "proper modeling" has not turned him into a reader, it's just not the way he engages with the world. And I have to remind myself so often that THAT IS OKAY! Debi: I don't believe the stereotypes about reading and class either - and if I had bought into them before, working at a library should have changed my mind in two seconds flat, because it's definitely not just middle class, college educated people that I see taking home bags full of books week after week. Yet I worry that the fact that the stereotype is so widespread can put people off sometimes - that it sends a subtle message that reading is not something people "like them" do. I agree 100% with what you say about Max - I mean, he's still very young and it's entirely possible he'll get into books later on, but even if he doesn't, there are other ways of engaging meaningfully with the world. Something that I often think about, though, is the fact that the way we define "reader" often excludes people who DO read a lot - but instead of books it's magazines, websites, comics, manga, fan fiction, blogs, etc. Obviously a lot of people know better than to discount these forms of reading. But for example, when I did my MA dissertation I saw this again and again: the kids would answer "no" to the first question, which asked them if they were readers, but them they'd thick a bunch of boxes in a follow-up question about what kind of reading material they consumed, and they'd say they read it "every day or almost every day" in a third question about frequency. Somehow they're still getting the message that this is not "real" reading, that there are right and wrong ways of being a reader, which just doesn't help at all. Ana, you *know* I knew better than to think you believed in those stereotypes, right?!! And yes, I love what you said about reading all different forms of media. How very depressing is it that we apparently place some sort of hierarchical importance to various forms of reading material period. But all the more depressing that we do it to such an extant that readers don't even see themselves as readers because of what they read.